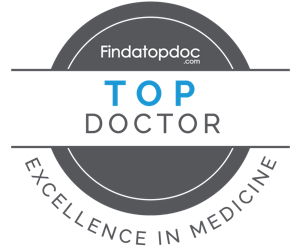 Our expert physicians provide leading-edge, comprehensive care in the diagnosis and treatment of orthopedic conditions, including total joint replacement and sports medicine. We apply the latest state of the art techniques in order to return our patients to their active lifestyle. 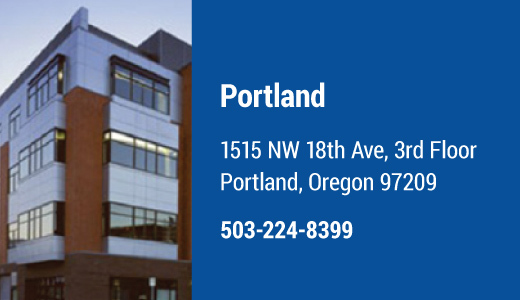 Our Board Certified Surgeons provide orthopedic care including fracture care, joint reconstruction, and stabilization of ligaments, tendons and muscle injuries including arthroscopic aided surgical repair. Dr. Dominic Patillo focuses on the treatment of both simple and complex hand and upper extremity conditions as well as general orthopaedic trauma. He is experienced with modern microsurgical techniques including nerve and vessel reconstruction. 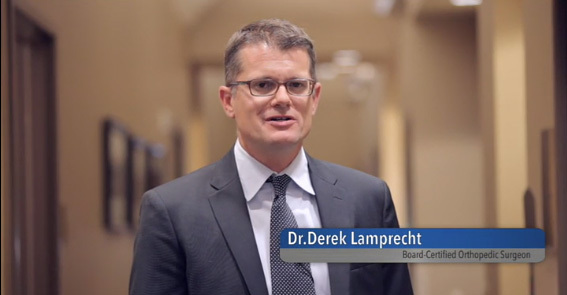 He appreciates the role of nonoperative treatment in appropriate cases, and encourages active patient participation in the decision making process. OSM Welcomes Dr. Andrew Bryan! 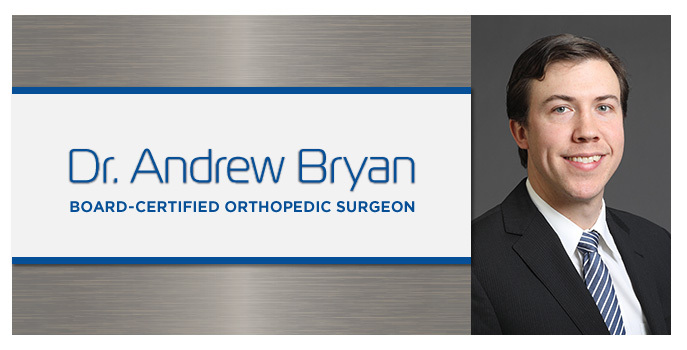 Dr. Andrew Bryan and his dedicated staff offer the most comprehensive approach to minimally invasive hip and knee replacement surgery. This advanced approach allows most patients to walk unaided and leave the hospital the same day of surgery. With Dr. Bryan’s approach, patients are able to regain motion and strength more quickly. New Location! 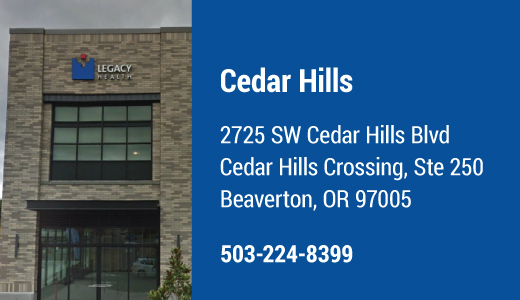 Effective May 1, 2019 we begin sharing clinic space with Legacy Westside Internal Medicine in Beaverton, Oregon at Cedar Hills Crossing. 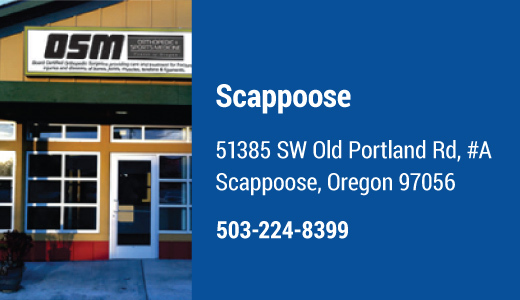 Location features easy access and plenty of parking! 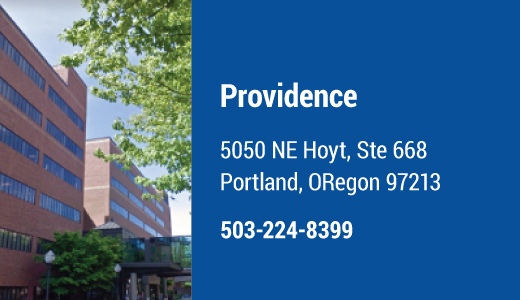 Surgical procedures performed at Northwest Ambulatory Surgery Center, Legacy Good Samaritan, and Providence Portland. OSM is a proud partner of Legacy Good Samaritan Medical Center. “Dr. Scott Jones really knows his stuff. 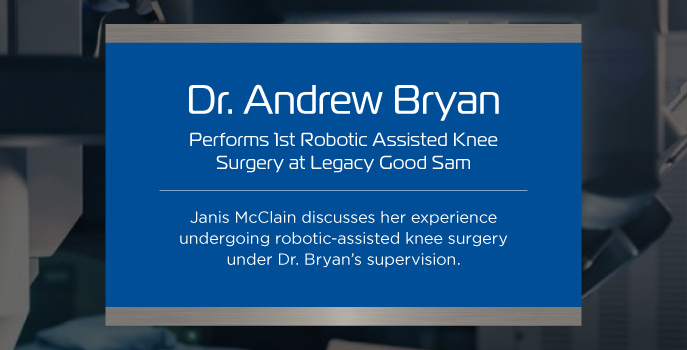 Within two minutes he had the correct diagnosis (re-absorbing calcium deposit), explained it clearly and concisely, was sympathetic and was able to give me a cortisone shot directly into the shoulder, which almost instantly began relieving my symptoms.” – Susan B.
Janis McClain, the first patient to undergo robotic-assisted knee surgery at Legacy Good Sam, discusses her experience with the procedure. Quick access to new patient information including appointments, fees and payments, prescription renewal information, and patient registration forms.